Anyway, this will be a fairly picture-heavy post so I’ll try to keep the words to a minimum! Here’s a photo to remind you of the room’s layout. I’ll start from the left and work towards the right! My first craft storage purchases for the last house were various sized Artbin Super Satchel storage boxes and three ArtBin Super Satchel Cubes to hold the containers. They mostly hold my wood-mounted rubber stamps and stamp supplies. 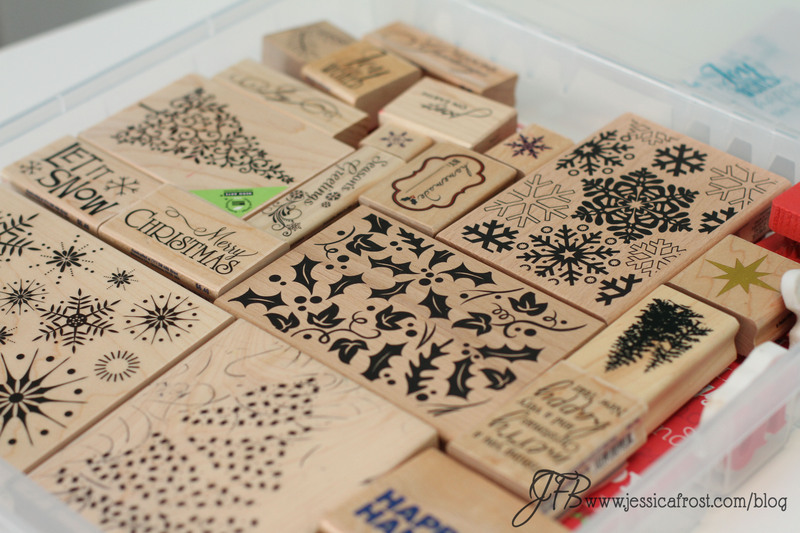 The stamps are grouped by category (Christmas, Holiday, General, Animals, Nature, etc.) and then stored in single layer containers. 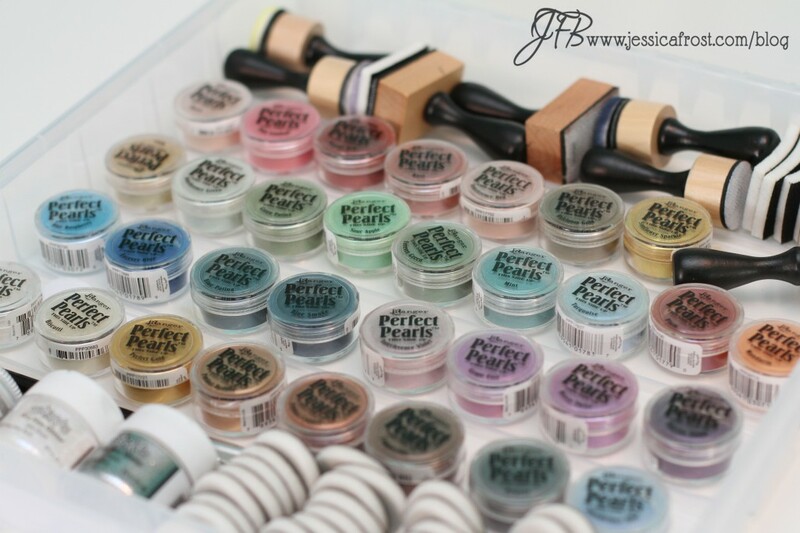 One container is devoted to some of my favorite Ranger products, specifically the Perfect Pearls pigment powders (I love the colors in that photo!)! Other containers hold samples of the cards I’ve created, extraneous glitters, glues, and embossing powders (from when I thought Michael’s was the be-all and end-all of crafting…wow, did I have a lot to learn), storage supplies and acrylic blocks, etc. Basically it’s a good solid storage unit that has given me a lot of options and flexibility. Moving along, there are three IKEA Linnmon rectangular table tops and one Linnmon corner table top that make up my work space. I used several different bases to support the tables: there’s an Alex drawer base, two Ullrik bases and Adils legs for the remaining supports. The Alex base holds a lot of random larger supplies that don’t fit anywhere else. To the right of the storage cubes is my main clear stamp, die, and stencil storage. I started with a single tiered clip-it-up but very rapidly ran out of room. Unfortunately the clip-it-up company is in the process of closing so it’s not possible to purchase a new base from them but they did have a great sale on the add-on tiers. I think you’re only supposed to stack them once but I risked a three tier and I think it’ll be fine as long as I’m careful with it. For a more uniform look I repackaged them in Avery Elle and Simon Says Stamp storage pockets and used a label maker to identify the brand and name of the set. Then they’re organized alphabetically within each brand. 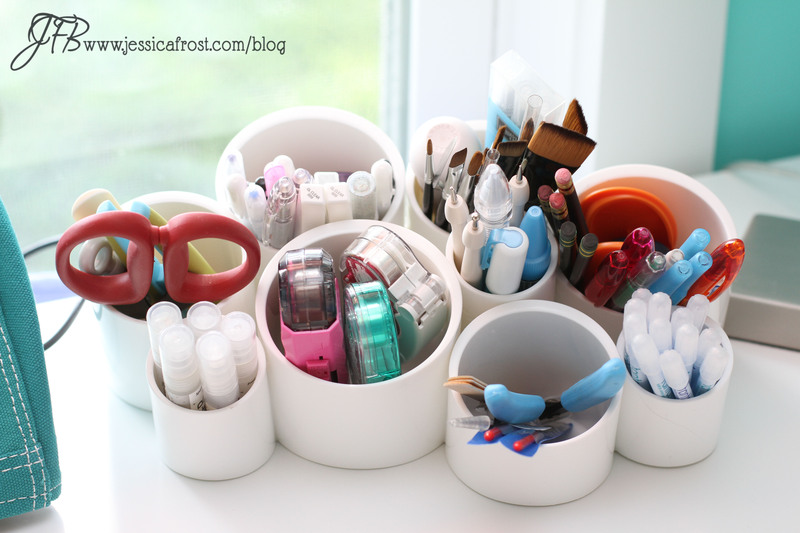 Most of my organizational ideas come from Jennifer McGuire’s blog. 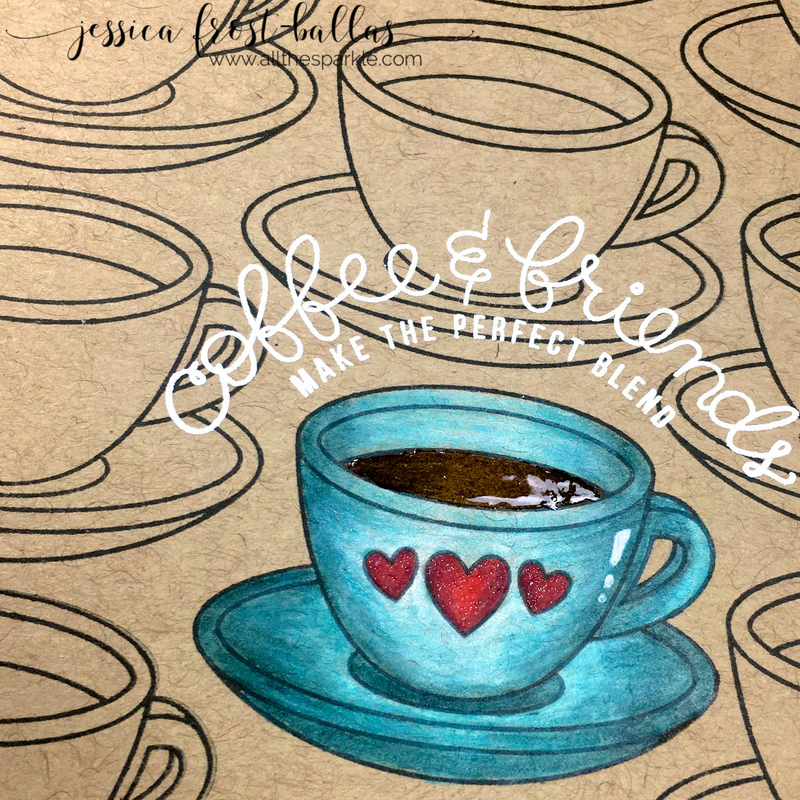 She is a fabulous card-maker who also posts wonderful tips and ideas for organization and great product reviews. Being organized has really helped me be more productive so that I’m not wasting time searching for things constantly. 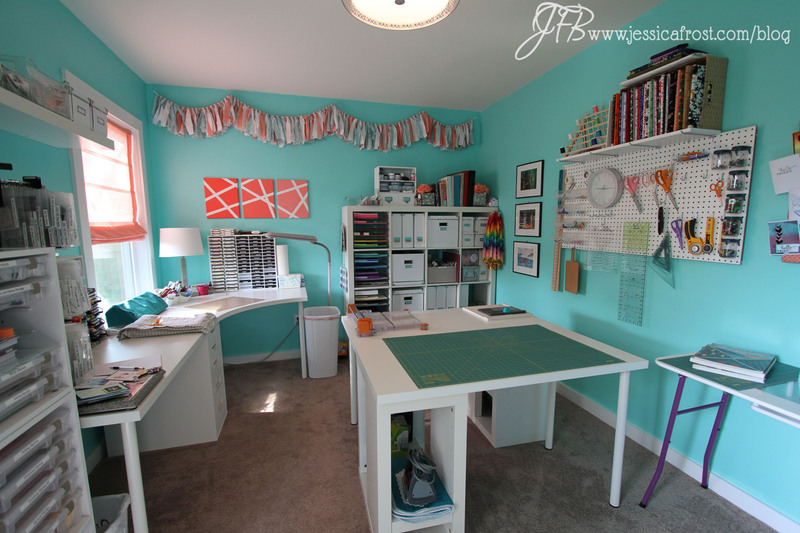 The next “station” is one of my favorites simply because it’s so bright and colorful! 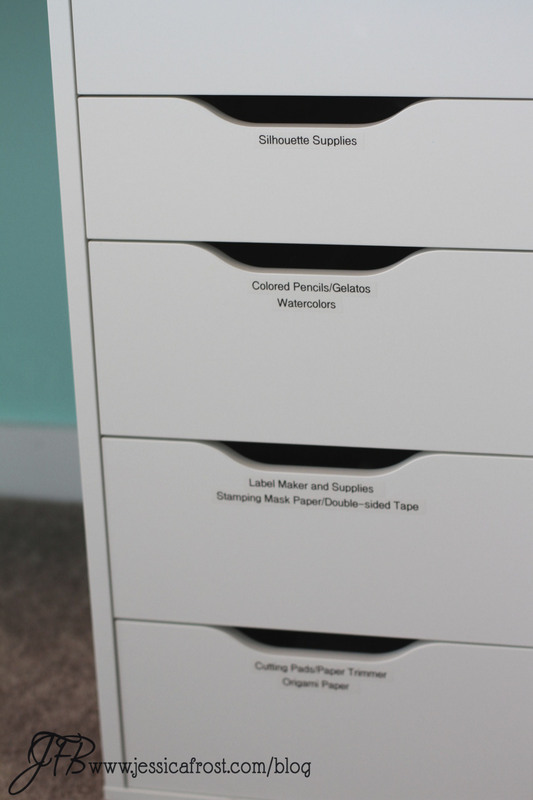 I use a trio of Color Cubbies to store all of my markers. It currently houses my Copics, Stampin’ Up markers, Prismacolor, and Distress markers. Above it, I have a little enclosed shelf (from another storage unit) that used to hold my markers. 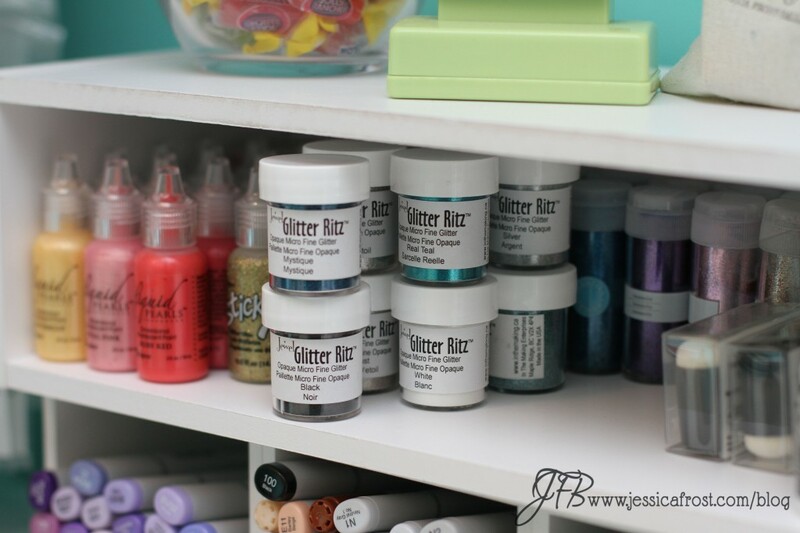 When my collection outgrew the shelf I removed the marker dividers and now it’s the perfect size to hold my extra fine glitters, Ranger Liquid Pearls, Stickles, Glitter Ritz glitters, and other small daubers, glues, and liquid accents. Moving on, I’m going to skip over my Silhouette cutting machine but it lives next to the pigment inks. Above this table is a Lack shelf from IKEA. 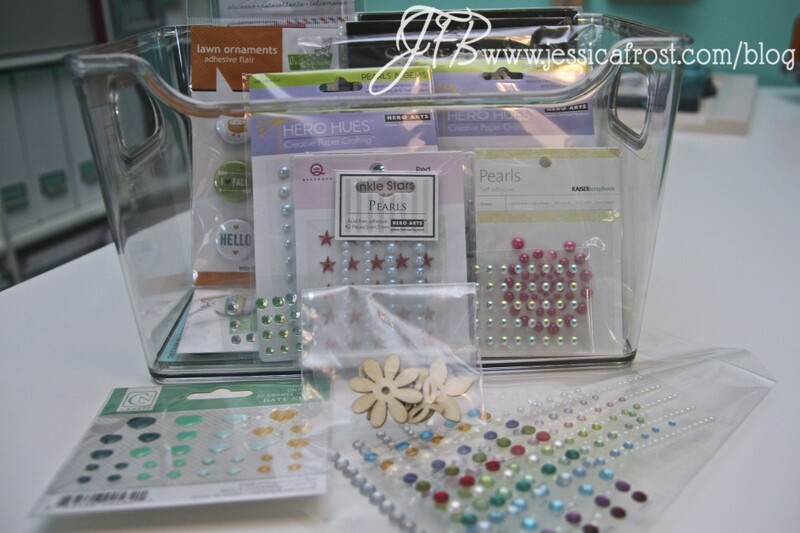 I use it to store my embellishments (ooh shiny! ), extra inks, and watercolor mediums. Earlier this year I took the Online Card Class for watercolors and just fell in love with each of the different watercolors they demonstrated. I tried to show restraint but I did end up purchasing gelatos, watercolor pencils, twinkling H2O’s, peerless watercolors (my favorite! ), and a couple cheap watercolor sets. 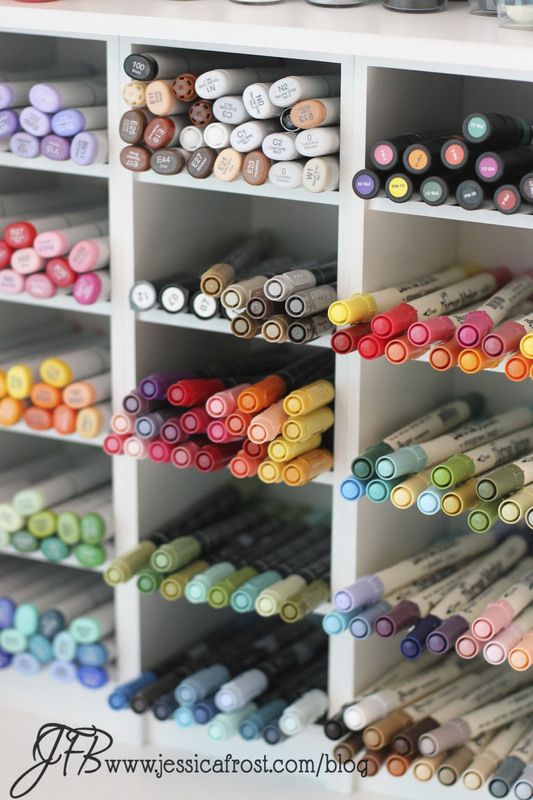 The watercolor pencils and gelatos are stored in a different drawer with my Prismacolor pencils but the rest of the watercolors are in that box. I have also run out of room for my regular dye inks so for now my small collection of Hero Arts Shadow inks, Simon Says Stamp inks, and Studio Calico Color Theory inks are stored in the other box. Here’s a close-up of some of those embellishments. 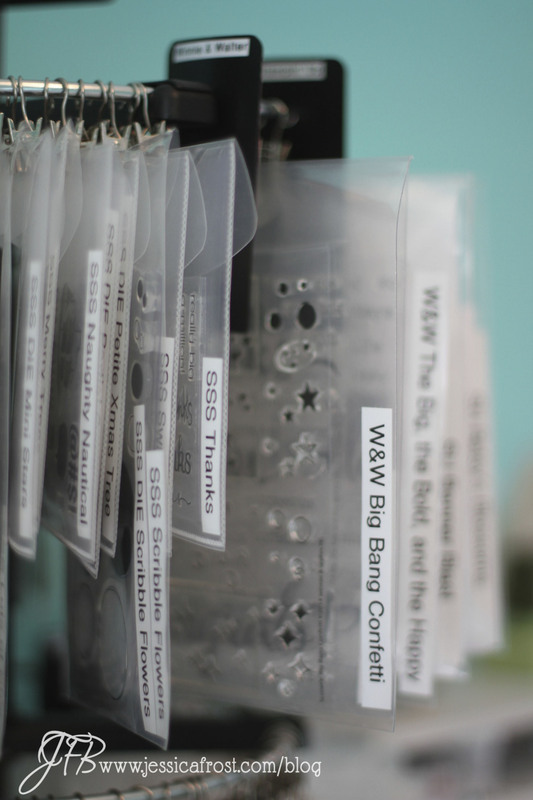 Speaking of embellishments, I almost forgot my absolute favorite embellishments (and one of my favorite storage systems)! 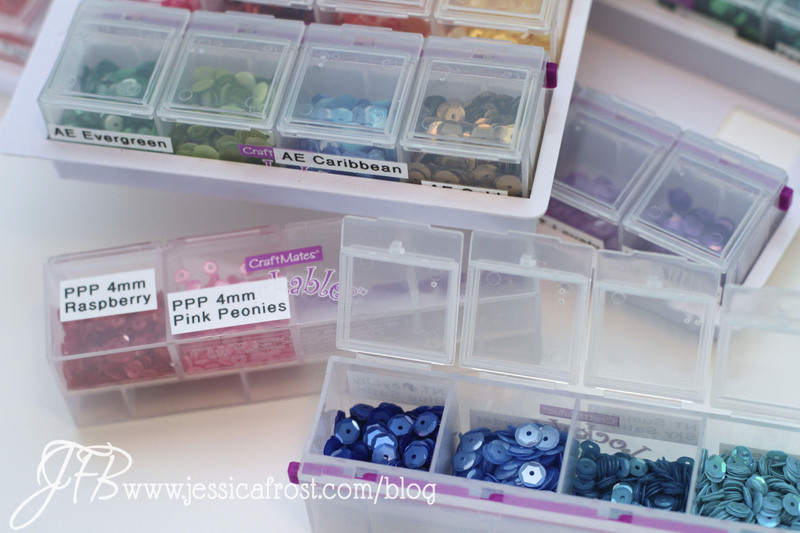 A few months ago Jennifer McGuire shared these containers for storing small embellishments and I was hooked. Again I love anything sparkly or shiny so these are a great way to organize and keep all of my sequins visible and easily accessible! My favorite sequins are those from Pretty Pink Posh and Neat and Tangled. 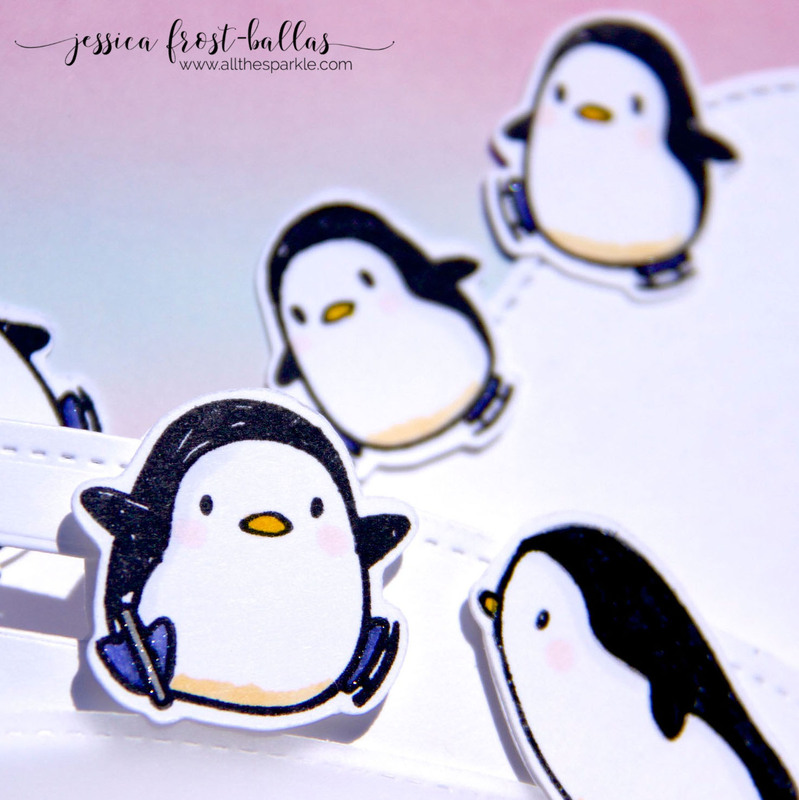 The colors are breath-taking and they add such a fun touch to a card! 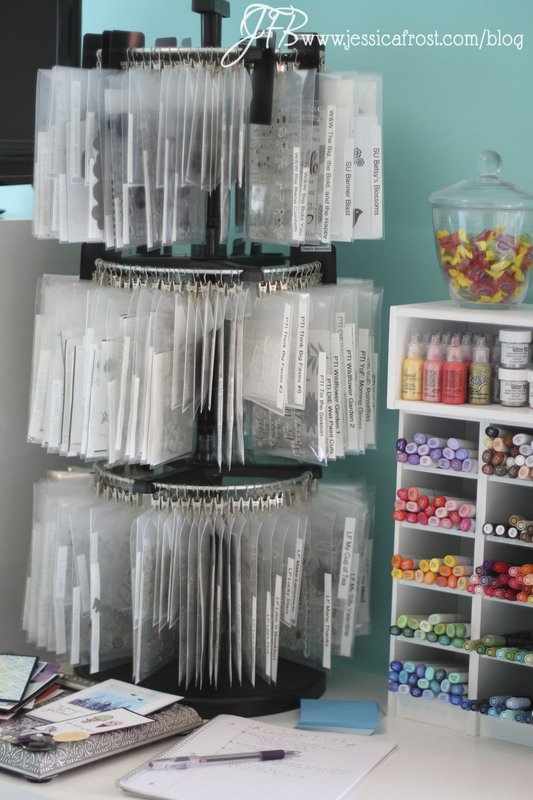 Here are the watercolors and other stamp pads that are stored up on the shelf! 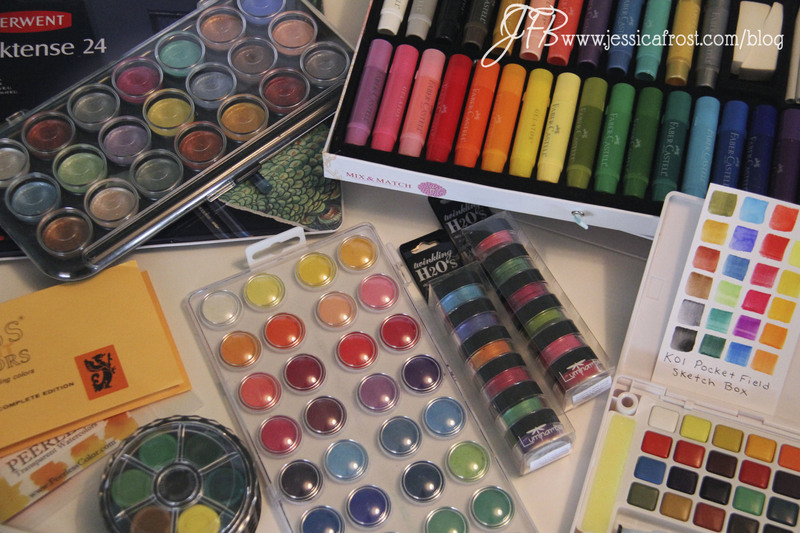 I also pulled out the gelatos and watercolor pencils out of their drawer to include them in the photo. I LOVE watercoloring on cards! 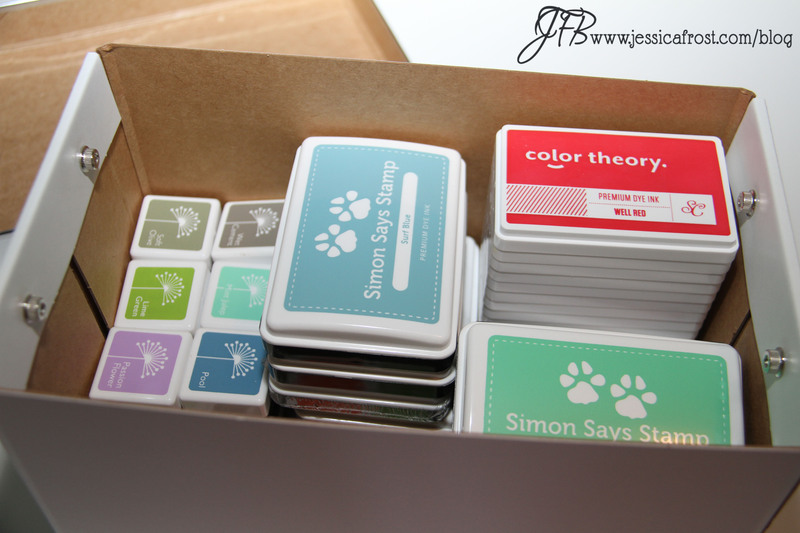 I’m hoping to slowly add to my Simon Says Stamp ink pad collection…I love the way their ink shows up on cards! This was another find from Jennifer McGuire. 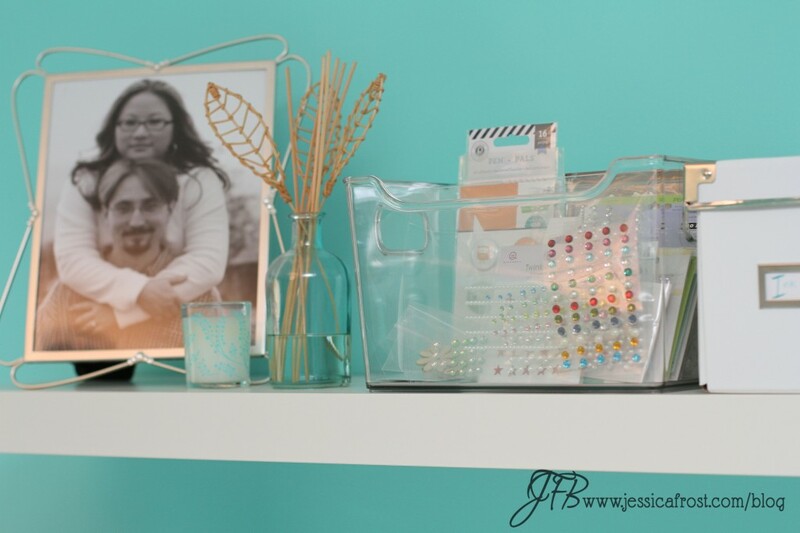 I love this organizer for the top of my workspace. I keep my most often used tools here where they are easily accessible. Anyway, this post is considerably longer than I expected it to be…congratulations if you made it to the end! 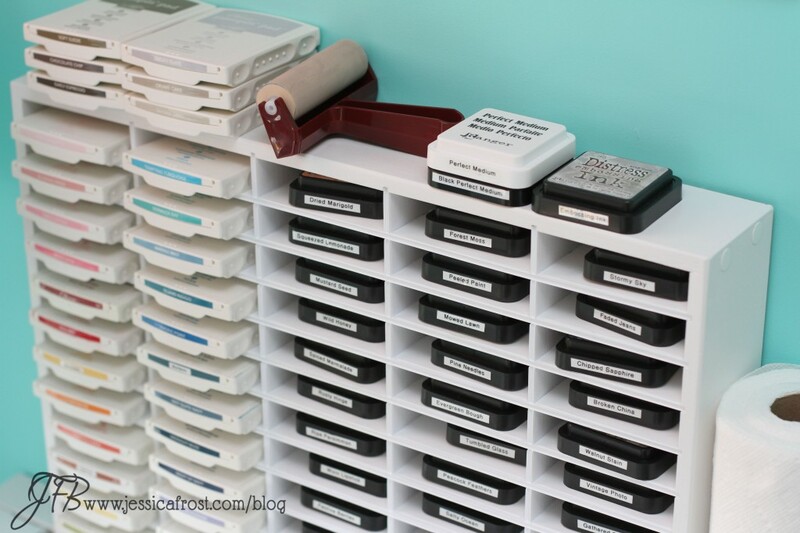 I think I’ll wrap up today’s post with my last collection of ink pads and will pick up on the Expedit, pegboard, and the rest of the room tomorrow! 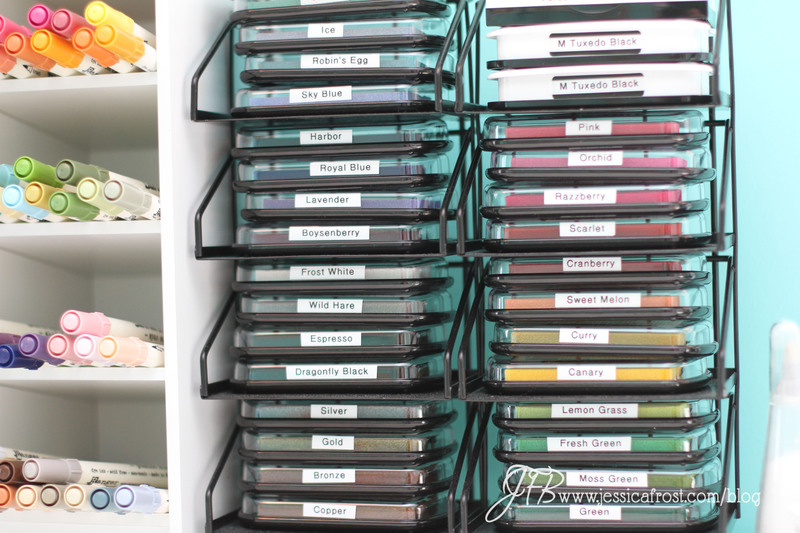 Finally, here are my Stampin’ Up and Ranger Distress ink pads stored on an Organize More unit. I also store my Speedball brayer and Ranger Perfect Mediums on top. In the future I plan to purchase another unit that is specifically made for Distress inks which will free up quite a bit of space for those extra ink pads in the box! Thanks for reading and I hope you’ve enjoyed the tour so far!